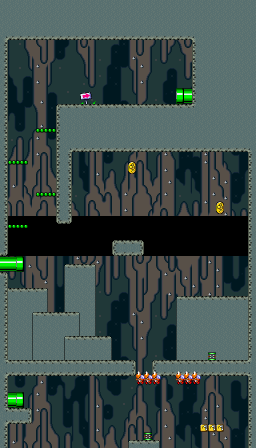 You will start at the bottom and have to make your way up to the pipe to reach the end of the level. Get up to the springs and jump to the left to grab a feather from the right ? block. Afterwards, jump up and to the right on top of the green pipe. Once on the green pipe, hit the middle turn block to reveal a vine. Climb it up and hit the turn block you find up there for a second vine that takes you further up. You will need to use the springboard to launch through the group of Paratroopas to the upper floor without getting hurt. To the right, you can find a feather in the rightmost ? block. The second springboard is not necessary unless you want to collect the Dragon Coins. Just go to the left, climb up the structure and use the springs to make it to the top pipe. The only thing standing between you and the goal tape is a Puntin' Chuck who kicks footballs. Pass under him to complete the level safely. You can wait until you complete the Blue Switch Palace. This will fill the blue switch blocks and create a platform. Carry the springboard to the platform and use it to launch yourself up to the pipe. 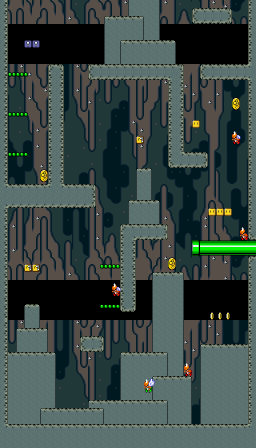 Or, you can enter the level as Cape Mario and just fly over to the pipe. 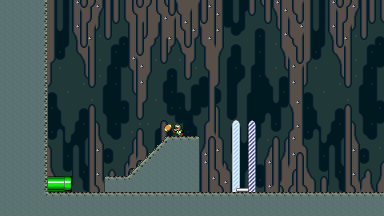 Once you managed to get to the pipe, enter it to get to the exit area. It looks very similar to the normal exit, but it's subtly different. Make it to the goal tape to unlock the secret exit. Next to the green pipe near the bottom. From the first vine, climb it all the way to the top and jump off to the right. In a hole on the left side, jump down after climbing the second vine. In the air near the top; use the springboard to reach it. Also in the air near the top, again use the springboard to reach it. This page was last edited on 2 August 2013, at 19:05. This page has been accessed 71,271 times.